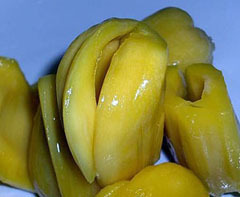 Jackfruit is very useful when it comes to lowering blood pressure due to its very high level in potassium. The root of the Jackfruit is known to have many curative benefits. Its extracts are used by many native medicine makers to cure fever and diarrhea, it’s also found to be beneficial for asthma patients, and used to treat many skin problems as well. Some oils can also treat many skin problems, such as tea tree oil, olive oil and jojoba oil. 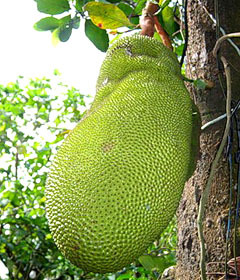 The Jackfruit Tree is an enormous tree which is large and bushy found growing mainly in tropical areas which are seen to have Monsoon rains. 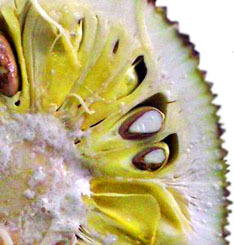 The young branches contain sticky white latex which can be useful to make birdlime. The leaves of this tree are oval shaped and deep green and glossy and grow in clusters. Its unique male and female flowers are borne in separate flower heads and are mostly seen in February and March. The male flowers are on the new wood above the female flowers. You can tell the difference because the female flowers appear on short twigs from the trunk. Male Flowers has pollen and the female flower doesn’t and another distinctive feature of the female flower is that it begins to swell very soon. 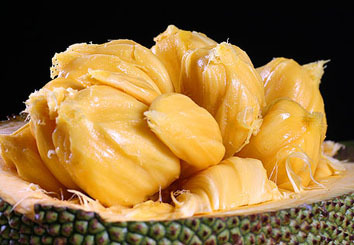 I would love to try jackfruit, problem is I don’t know where to find them in the Cleveland area. Can someone direct to a place I can purchase these fruits? I LIVE IN 2136 COOLEY AVENUE, EAST PALO ALTO, CA. I AM LOOKING OF WHERE CAN I GET SOME JACK FRUIT LEAVES. THIS MIGHT BE AN ANSWER TO MY HEALTH PROBLEM IN BREATHING. PLEASE IF YOU DON’T MIND SEND ME SOME INFORMATIONS. Since I discovered eating Jackfruit, I had enjoyed it. Initially I did not know its name. I kept searching on the net for it under species of fruits and finally I got it. I was so excited because I can now search more about it. I became very much more excited that I have been doing myself a lot of good eating Jackfruit on a daily bases. Sometimes I will eat only jackfruit, drink water and sleep off. Jackfruit is food. I was only eating the pulp alone, not knowing I was wasting it, but now I peal the green back carefully and slice the inside flesh into small pieces as meat, salt them and fry them in vegetable oil. It gives a very heavy palatable meal when it becomes golden yellow. It is a wonderful discovery to me. 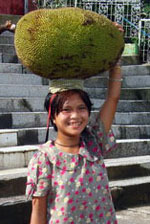 I will see that Jackfruit is eaten widely in Nigeria. 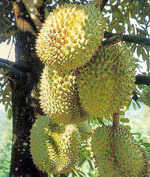 I know now that I will remain young because I it Jackfruit daily. 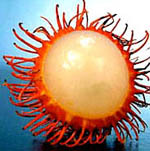 But most people around me don’t like the fruit because of the rough apperance which looks frightening. My small baby who is less than two years cries when she sees Jackfruit. But I am happy that my wife and my other bigger children eat the fruit.